Visual Studio .NET Communications driver for Siemens S7-1500, S7-1200, S7-400, S7-400, and S7-200 PLCs. Automated Solutions develops and sells software products for industrial and process automation. We also provide custom development services using our products for organizations that need custom HMI, SCADA, interface, or logging applications, but are short on development resources. Our software products do not target specific industries. They are used in diverse industries such as agriculture, automotive, mining, gas, building, construction, food & dairy, beer, wine & spirits, textile, mills, and petroleum. You can even find our software on submarines, in amusement parks, and Internet telescopes. Founded in 1994, our software products are now used by over 3300 companies globally to build high performance, cost effective HMI, SCADA, machine control, and data logging applications. Automated Solutions ASComm.NET is a fully-managed .NET component that delivers communications connectivity between .NET applications and a broad range of industrial devices (PLC, PAC, Instrumentation, etc.) using popular communications protocols. Visual Studio developers can now quickly and easily build HMI, SCADA, Historian, MES, ERP and other custom applications using ASComm.NET for the communications engine. All supported protocol drivers are implemented in the ASComm.NET component, providing a single, consistent API regardless of the underlying protocols or hardware devices. Each driver can be licensed individually, so you only pay for the drivers that you are developing with. Does not require Siemens or 3rd party drivers. Broad .NET target support including Web, Windows, WPF, console, and service apps. Excel Add-in allows you to quickly and easily populate Excel spreadsheets with no programming. Example applications with VB and C# source code included. Easily connect business systems to factory floor systems. 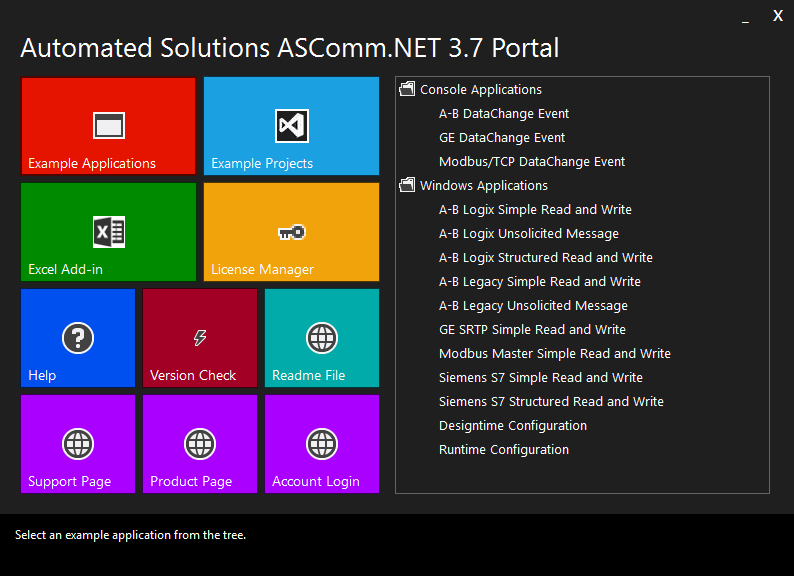 The ASComm.NET Portal application is a convenient way to access ASComm.NET development resources. ASComm.NET comes with a variety of Example Applications, C# and VB Example Projects, Excel Add-in, License Manager, Help System, Update Check, and Web resources to help you get going quickly. // Preset properties to 500 mSec update rate and active flag set to false.
' Create Group with 500 mSec update rate and active flag set to false.